Railway transport is far more energy efficient as compared to road transport. Railways are; a) Six times more energy efficient as compared to road, b) Four times more economical in land use c) Six times more cost effective vis-à-vis road in construction costs for comparable levels of traffic. Among the modes of rail transport, electric traction is the most energy efficient. This can be seen in the light of the fact that every 100 route kilometers electrified section results in saving of annual consumption of more than four million liters of diesel oil, which saves Rs. 2500 Crores worth foreign exchange annually. Electric Multiple Units (EMUs) are ideal for suburban services with higher acceleration and braking features required for frequent starts and stops. EMU services form the backbone of suburban transportation in the metropolitan cities of Mumbai, Kolkata and Chennai. In Mumbai area alone, about 1950 EMU trains are running daily on the suburban sections of Central and Western Railways which cater for about 5 million passengers every day. Electrification has made possible the introduction of EMU services in many suburban like main line sections. These services have become extremely popular. Electrification is making possible running of heavier freight trains. With the imported 6000 HP Thyristor locomotives, a consist of two of these locomotives, presently handles 4500 tonne trains in gradients upto 1 in 60 as against three numbers of 4000 HP earlier locomotives. Running of 9000 tonne trains is also possible with such locomotives, as has already been proved in tests conducted successfully in Ghaziabad - Mughal Sarai section. With the introduction of electrification, 21 passenger coaches are hauled by a single locomotive in most of the sections. A single electric locomotive is now hauling Prayagraj Express with 24 coaches between New Delhi and Allahabad. Introduction of Shatabdi Express services operating at 130 KMPH under electric traction have been achieved purely through indigenous efforts of Indian Railways. One of the major advantages of electric traction is pollution free atmosphere not only to the travelers but also to the surrounding environment. Electric traction is proven to be less pollutant than the existing diesel mode and thus could be more eco-friendly to an area having delicate flora and fauna. Electric traction could reduce noise and air pollution and result in lesser disturbance to wild life habitant of the region. 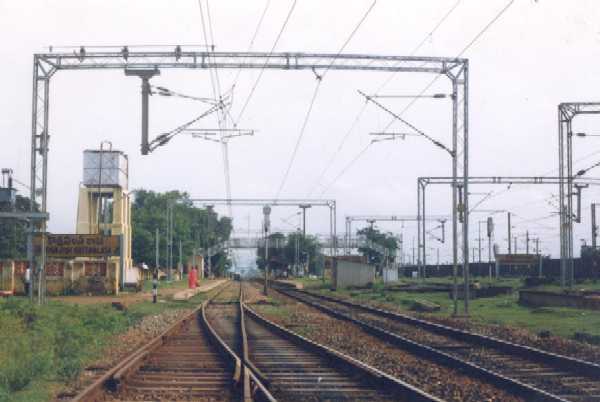 a) Modernization of Equipment - With a view to bring down the maintenance cost and improve the reliability of power supply system, Railway Electrification has gone in for state-for-the-art technology as prevalent in the international arena viz., dry cast resin transformers, SF-6/Vacuum switch-gear, long creep age solid core insulators and PTFE neutral section. 8 wheeler self-propelled OHE inspection cars have also been introduced to improve maintenance. Action has also been initiated for procurement of OHE recording car for monitoring the performance of overhead equipment. Signalling and telecommunication systems are also upgraded by adopting state-of-the-art technology. Semaphore signalling system is being replaced by color light signalling system. Use of color light signals results in better visibility of signaling aspects to the loco pilots of running trains and this makes train running safer and operationally efficient. Inter-locking system is also being changed to panel or route relay interlocking. Besides speedier movement of traffic, these up-gradation measures contribute towards increase in safety. Underground cables are provided along with electrification, which results in more reliable and better quality of communication. b) Supervisory Remote Control & Data Acquisition System (SCADA) - 220 / 132 / 25 kV power supply network for electrification extending along the track over a zone of about 200/300 km is centrally controlled from the division control center through remote control arrangements to ensure un-interrupted power supply to the track overhead equipment. In the present day electrification projects, state-of-the-art microprocessor based supervisory control and data acquisition system (SCADA) is being provided as against the earlier electro-mechanical strowger system of remote control equipment. The SCADA system has facilities for tele-metering of voltage, current, maximum demand and power factor on a real time basis which enables control of maximum demand and thereby the charges thereof to be paid to the State Electricity Boards. In addition, this system provides for automatic trouble shooting and isolation of faulty section. c) 2 x 25 kV System - Indian Railways have introduced 2 x 25 KV Auto Transformer Feeding System of power supply on Bina-Katni-Anuppur-Bishrampur/Chirimiri coal route of Central Railway and South-Eastern Railway as distinct from the present conventional 25 kV AC system. With this system the advantage of high voltage transmission, i.e. 50 KV is realized permitting at the same time inter-running of standard 25 kV electric locomotives. This is achieved by an additional power conductor on top of the overhead equipment and the mast with 50 kV being obtained between the overhead equipment and the feeder. In addition, use of return conductor and booster transformers is eliminated completely. This pilot project has been executed with the technical guidance from Japanese Railways Technical Services (JARTS). This 2 x 25 kV traction system is already in vogue on the TGV of France and Shinkasen of Japan. 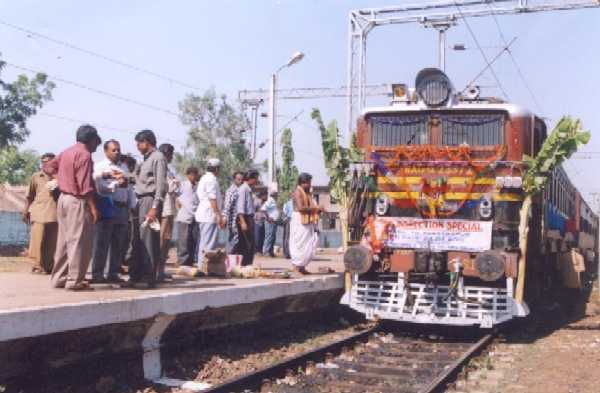 As part of the modernization plan, Indian Railways had imported eighteen 18 6000 Horse Power Thyristor Locomotives, with transfer of technology. Indian Railways have developed chopper technology for DCEMUs in collaboration with Bhabha Atomic Research Center (BARC) and motor coaches with this technology have been inducted in service. The chopper technology, in addition to being less maintenance intensive is expected to save energy up to 30% to 34% in the sub-urban services. i) Optical Fibre Communication - Indian Railways have gone in for modern communication technology and are using Optical Fibre Cable. This cable is free from copper and is, therefore, not prone to theft. It provides superior quality of communication with built in large number of telephone channels to meet future needs of train operation and safety. 2572 Kilometers of Optical Fibre communication system have been commissioned on the Nagpur-Itarsi, Nagpur-Durg, Itarsi-Bhusawal, Jhajha-Mokama, Tori-Gumia, Ambala-Saharanpur, Adra-Midnapur, VSKP-Golanthra, Shoranur-Ernakulam, Tata-Chakradharpur, Delhi and Mumbai area sections as part of Railway Electrification, so far. Indian Railways has also taken a policy decision that in future along with Railway Electrification, they will lay 24 Fibre Optic cable. They have also started making efforts for the commercial exploitation of their existing communication infra structure and to exploit their "right of way" along the tracks by private parties laying their Optical Fibre Cables. ii) Train Radio Communication - Optical Fibre technology has come in handy for introducing Mobile Communication from running train and has been successfully introduced along with electrification. With this the loco pilot and guard of the train can talk to each other and with section control on moving train. This will be especially useful in emergencies like accidents etc. Provision of single transformer at alternative TSS. Provision of single circuit transmission line. Reduction in requirement of BT-RC to the level of 20% of route length. Use of 5mm droppers in place of 7mm droppers. b) Staff Reduction - Although the work of Railway Electrification organizations are increasing day by day, there is continuous reduction of staff in the organization which is clear from the following chart. From the above chart, it is clear that this organisation is doing maximum work with the minimum staff and saving the government exchequer. c) Closure of RE Stores Depots - Normally a stores depot stocks material worth Rupees seven to twelve crores. To save on the inventory costs and the overheads thereon, the closure of depot has been identified as a thrust area in view of economy. As soon as the work in the project is finished, the store depot along with the project, is closed, thus, saving lot of costs towards inventory, establishment etc.